I have been making dog bows since 1988 when our first little Maltese joined our family - so after all this time I know what makes a good bow! I have had the pleasure of sharing life with two adorable 'bow-wearing' Maltese for over 25 years. Our first Maltese lived a pampered 17 years and now our new little Maltese is already turning 12 this summer! Since this is "About Us", a little about me. I've worked with a major Toronto design firm for many years and several years ago, opted to add some new directions to life. BowBiz Dog Bows is one of those. I am an entrepreneur, a passionate long-distance, multi-marathon runner and a second time around Maltese owner. Our first Maltese, enjoyed a wonderful pampered life to the age of 17. Since we found it hard to live without four little furry feet happily pattering about in our home, we welcomed a new family member, another sweet Maltese who, as you can see, is my best little friend and is always on my lap! I provide high quality products at affordable prices. I take great pride in producing high quality, and yet still affordable, dog bows. 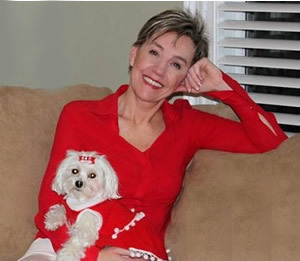 I believe that all furbabies deserve to be pampered, look & feel special - without having to break the bank! A winning combination at BowBiz Dog Bows: high quality bows at affordable prices! One of the great things about BowBiz bows is that you can build a "bow wardrobe"! How & why? 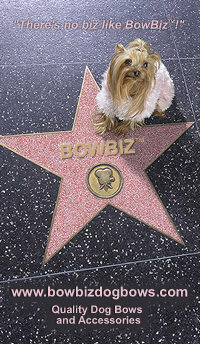 Well, BowBiz dog bows are meticulously hand-made with great attention given to detail. BowBiz bows are long lasting and durable and they are not a "use it a few times, fall apart type of disposable bow". BowBiz bows are not only uniquely designed but also long lasting and professionally created. This is why you can use them as a staple in your bow wardrobe for years to come. I value you as a customer. At BowBiz, you are not just dealing with a 'website' or an 'online business'. You are dealing with a fellow furbaby lover. You, your order and your furbaby are important to me! I am always just an email away ... and am always available to address any concerns, special requests (or just to admire photos of your baby!). I genuinely love what I do - making special furbabies even more beautiful and handsome! At BowBiz, my goal is simple - to make you happy. Each of my bows is handmade with great attention to detail. My aim, at BowBiz, is not to simply take your order - but to make you happy in the long run. I strive to make your experience with BowBiz Dog Bows a great one, so that you feel comfortable in returning for your future bow needs in the secure knowledge that you will always get an excellent product combined with excellent service at an excellent price. I, and only I, create your bows. No delegating of work - you will always get the same special touch - and know exactly what you can expect - top quality dog bows from BowBiz Dog Bows. I handmake your bows with care. little pup to wear. All embellishments are firmly attached by handsewing. I refuse to use anything such as feathers or loose glitter which could cause damage to your furbaby's eyes. I have spent much time perfecting my bows - you will never find any loose threads or sloppy imperfections! All bows are produced in my bow studio which is a dedicated, non-smoking environment housing the best materials including a bow stiffener certified as non-toxic. Nothing but the best for your furbaby - besides beauty, your little one's safety is a high priority for me! Specific information pertaining to the creation of BowBiz Dog Bows can be found on the Bow Details page. Quality crafted product. Strong customer care. Speedy delivery. And always, a special personal touch. It's often been said "There's No Biz Like BowBiz!" - so much so that I've added it to the BowBiz business card! I appreciate my loyal customers and warmly welcome new ones! To my existing clientele, a heartfelt thank you to all for your dedicated business. To all newcomers, a big warm welcome.